Power Tool Drag racers made from angle grinders and RC car tyres. 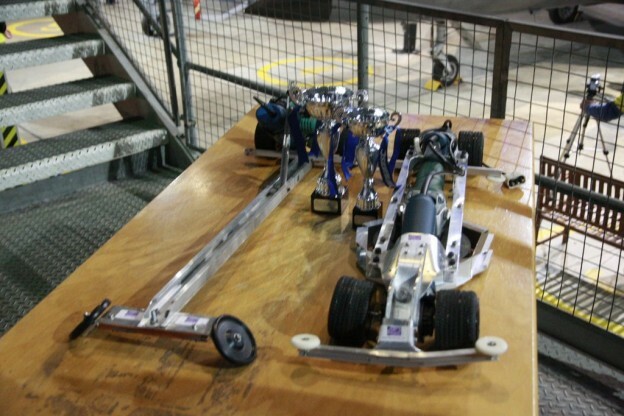 Dragster on above left, the mk1, was simple and lightweight and came second in 2010. The mk2 dragster on right used a third angle grinder to drive a flymo fan to create downforce – doubling the grip once up to speed. 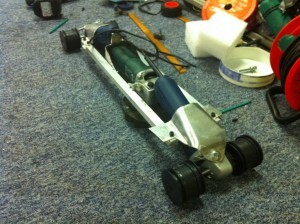 This dragster came third in 2010. The mk1 started from humble beginnings. We each had a scrap anglegrinder, mine had loose brushes and was given to me when a friend wanted to chuck it out. While fixing the brushes I swapped them to make it spin backwards. 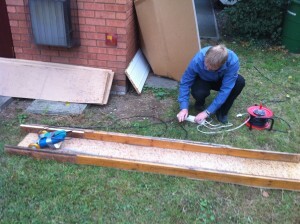 Mark then cable tied them together attached a couple of castors and set them loose on a bit of scrap wood built into a track. It didn’t get much traction but did melt the wheels! 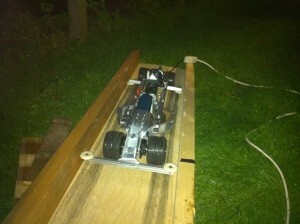 A summer student Jim had an RC car with very grippy tyres, inspiring us to find some very soft road tyres. We also followed an RC racing trick of reinforcing these tyres with carbon fiber tow to avoid them tearing to pieces under centrifugal force at the 100mph tip speed they reach if unconstrained. 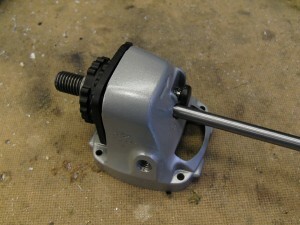 The focus was balancing the mk1 to put all its weight on its rear wheels to maximise grip while keeping it quite light. 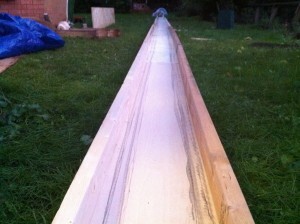 A week or so later and the mk1 was finished and able to put down a pair of 11s in burnt rubber 20 meters long. 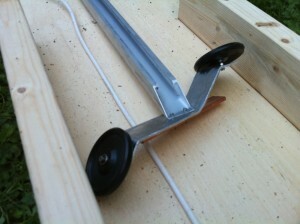 It turns out that a 3kg dragster doing ~40mph is difficult to stop. 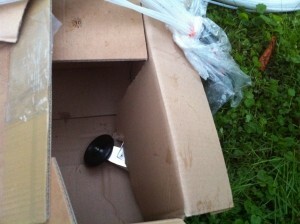 We used empty boxes but even these regularly damaged the dragster as it javelined straight through! Testing was so promising we decided to make another indoor dragster and to keep it interesting we chose to take a totally different approach. Based on our testing we knew that the power to weight was not important given we were traction limited all the way down the track. We had optimised the balance for rear wheel drive so the only way to improve it would be to add front wheel drive too. 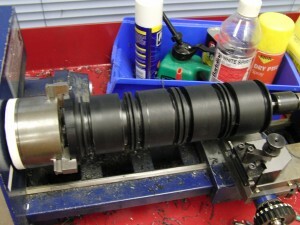 We special ordered softer tyres from the US of A and set to work making a 4 wheel drive dragster. To give more traction still we had the slightly mad idea of sucking the car to the track like a Brabham F1 car. 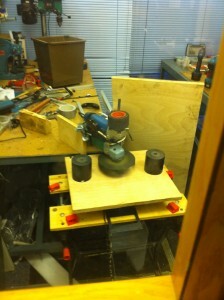 After a fair bit of investigation, a third angle grinder with a flymo impeller to generate a suction vortex was chosen. 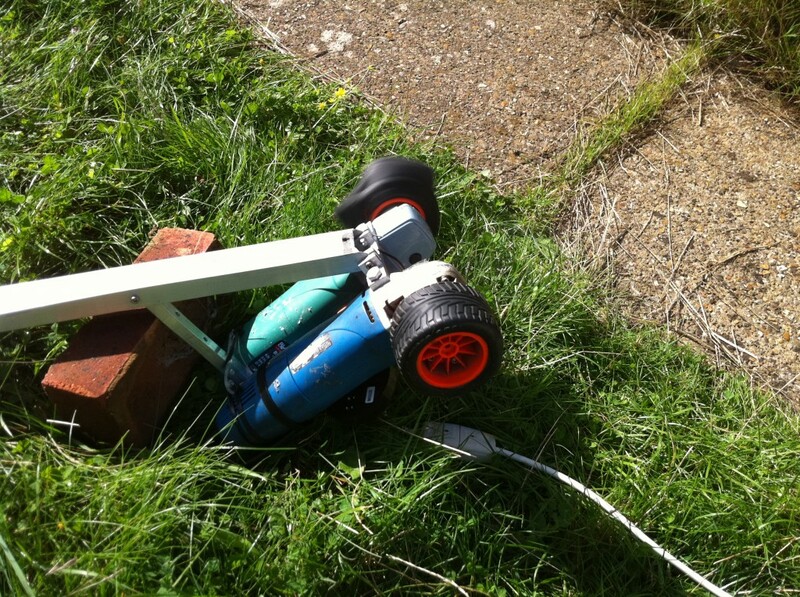 In testing it almost disasterously overperformed, generating about 3kg of downforce unexpectedly; a last minute decision to go belt and braces saved the flymo impeller from inhaling a large sheet of plywood! 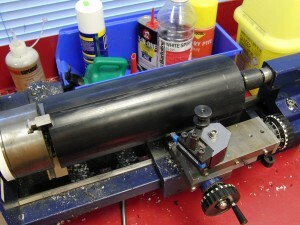 To get 4 wheel drive Mark modified the angle grinders to have shafts both sided. These mods lasted us until the final run when on of the shafts came off allowing the wheel to trip the light gate early recording 106mph! Mk2 – Note the prettier nose, pre crashing on the very first test run! 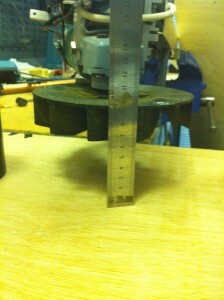 We did also fit a fan guard to protect the fan in a crash and to protect everyone in the event of a fan disc failure! The timings for the final are below, prior to this race neither team had broken 2.31 seconds. 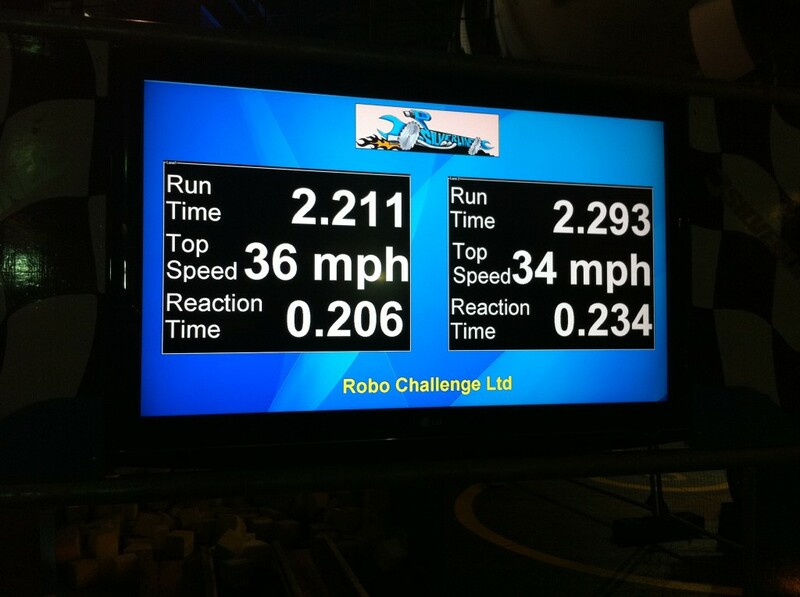 Timing screen from the final – SOOO CLOSE! Why did the mk1 beat the mk2? All in all it was just proof behind the KISS motto… Keep it simple, stupid!